While last year no Irish authors made the Man Booker Prize Long-list, this year three Irish authors including one from North Tipperary have been nominated, it was formally announced today. 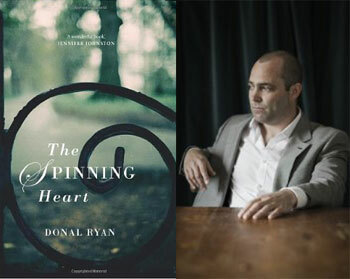 Co-published by The Lilliput Press and Doubleday Ireland, “The Spinning Heart,” is the début novel of Tipperary born Donal Ryan. Donal Ryan was born in Burgess, a village here in North Tipperary, latter just a short distance from the shores of Lough Derg. Educated at St Joseph’s CBS in Nenagh, Donal, currently lives with his wife Anne Marie and his two children, just outside Limerick City. He claims to have written the first draft of this novel in the long summer evenings of 2010, and though set in a fictional village, his book makes mention of many of North Tipperary’s place names such as Nenagh, Roscrea, the Lookout, and Carney. His story, which centres around the kidnapping of a child and the murder of a man, is set against a backdrop of surface tension, violence in the aftermath of recession and will be seen as speaking in particular for contemporary Ireland, possibly like no other novel to date. Wry, vulnerable, daring, human and evocative, this novel captures the language and spirit of rural Ireland and, with uncanny perception, articulates the words and thoughts of a current breathing, yet fractious generation. “My father still lives back the road past the weir in the cottage I was reared in. I go there every day to see is he dead and every day he lets me down. He hasn’t yet missed a day of letting me down.” In Donal Ryan’s work, expect to find a stunning new voice in literary fiction, whose turn of phrase creates vivid pictures in an otherwise present day drab rural inward eye. Seven of the 13 authors selected from some 151 books are female and three are début authors. The oldest author on today’s list, Jim Crace is aged 67 and has been previously nominated in 1997 for Quarantine, while the youngest nominee is the New Zealander, Eleanor Catton, aged 27. The short-list of books chosen for the prize will be announced on September 10th and the winner will be announced later on October 15th. The winner will receive a prize of €58,000.